Here is an example of the results from running a DairyMod simulation. Further information is given below the image. The screenshot shows the graphical output for a multi-paddock dairy simulation. 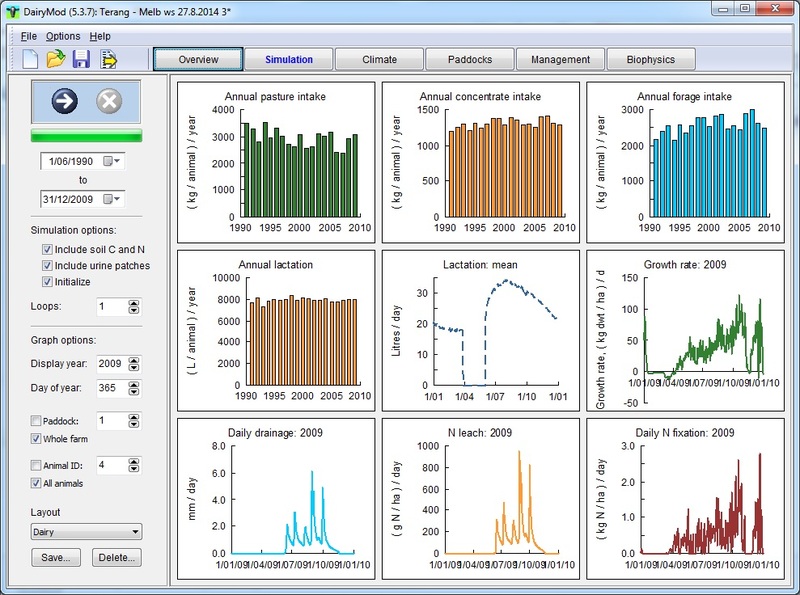 The individual graphs can be selected from a large range of options for analysing the plant, water, soil, and animal simulation results as well as the system greenhouse gas dynamics. There are five different graph types for annual sums, monthly statistical values, daily statistical values and individual daily values as well as distribution profiles (where relevant) through the soil. Screen layouts can be saved and loaded for different types of analyses. All graphs and the underlying data can be copied to the clipboard. In addition, simulation output can be exported to Excel for further analysis. © 2019 IMJ Consultants. All Rights Reserved.